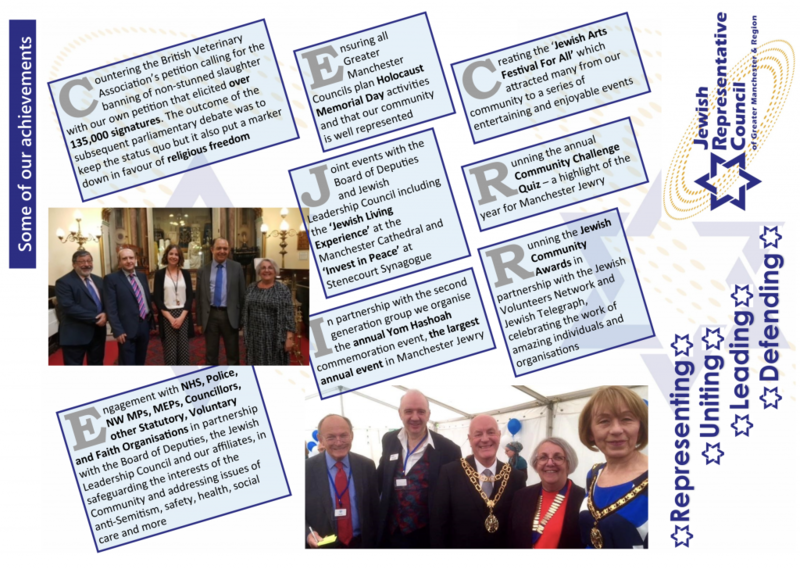 In 2019, The Jewish Representative Council will be celebrating the centenary of serving and representing the community since 1919. We are proud to be part of the great diverse community of Greater Manchester, working alongside others, leading, uniting and promoting community cohesion, particularly in these difficult times. In recognition of our achievements, we are producing an historical souvenir about the Council and its contribution to Manchester Jewry, entitled: ‘100 Years and Counting’ (Kindly sponsored by Beaverbrooks). We invite you to partner with us in celebrating this very special anniversary by sending a greeting to be reproduced in this book. Your support for this appeal will enable the Jewish Representative Council to continue its vital role working for our community for many more years to come. Throughout the year we will be having many events to celebrate our Centenary, including a Centenary Dinner, to which we look forward to welcoming you. If you would like further information about the Centenary celebrations including tickets for the Dinner please contact us at: [email protected] , or 0161 720 8721. You can download the leaflet and the brochure with which to make your donation below.